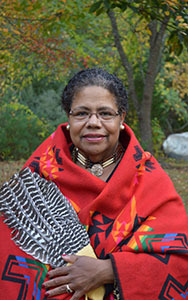 Lynn Powers, Moonlight Snow, is the Tribal Council Recording Secretary. She has been involved with the tribe since the 1990’s, and at one time was the Tribal Manager. Lynn has been a council member for approximately 20 years, serving as the Recording Secretary for the last 10 years. She holds a Bachelors degree in Mass Communications and a Masters degree in Organizational Management. One of her life goals is to see her Tribe regain its Federal Recognition and for future generations to know who they are, be proud of who they have descended from, and be financially secure. Lynn is a manager of Organizational Development and Training and a lifelong resident of Mystic. Another interesting fact about her is that she has owned and managed several small businesses.